There’s no shortage of high-rise development in Long Island City as sparkling offices, apartments and hotels are stacked atop reclaimed industrial sites from Hunters Point to Dutch Kills. However, Corte, one of the blossoming district’s newest high-end developments, is a squat eight stories and spans 250 feet along 44th Drive. It’s a cherry tree in a forest of maples, but developers expect it stand out in other ways. Though it’s several blocks from the East River, the 85-unit condo building has a protected view of Queensborough Bridge and Midtown East in Manhattan. 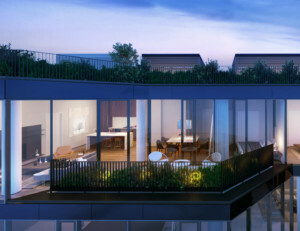 Sizeable glass terraces create a unique façade while promising an integrated indoor-outdoor living experience that will be accentuated by a backyard garden. Glass terraces create a unique façade while promising an integrated indoor-outdoor living experience. “Generous open space, carefully located views, and meticulous craftsmanship are the highlights of Corte,” said Carlos Cardoso, a partner at Beyer Blinder Belle, one of two architecture firms hired for the building. Blending Buenos Aires aesthetics with Manhattan luxury while trying to remain true to Long Island City’s industrial past, Corte looks to offer buyers an eclectic living experience in what is already Long Island City’s most wide-ranging neighborhood, Court Square. The area is home to cultural establishments, such as MOMA’s PS1 museum and the Chocolate Factory Theater, a performing arts space, as well as active industrial warehouses. Adjacent to rugged loft conversions is a row of Brownstone townhouses that have doubled for the Upper East Side in a slew of film and television shows. Court Square stands apart from Long Island City’s thriving waterfront while also offering close proximity to Midtown. 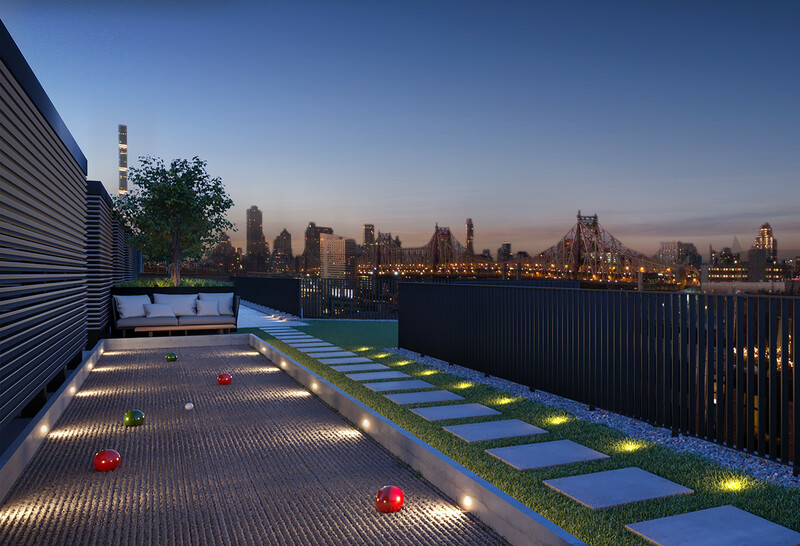 The same can be said of Corte, which, despite its medium-rise stature, still offers impressive views from an expansive roof deck that will feature private cabanas and a shared bocce court with a Manhattan vista. A rooftop bocce ball court features a protected view of the Queensborough Bridge. width of 44th Drive and the proximity to the waterfront,” said Tristan Dieguez, co-founder of the project’s other architecture firm, Dieguez Fridman Arquitectos & Asociados. “This is achieved through the combination of two design strategies: the first is the mix of projecting volumes with parts of the massing that are set back from the street line. The south side of the building will be home to a landscaped garden with a Japanese maple tree that will grow through an opening in the back deck — a green roof that will house private gardens for second-floor units. On the ground floor, the tree will be flanked by a fitness center on one side and a residents’ lounge on the other. A joint venture between Planet Partners, an Argentine developer, and CBSK Ironstate, Corte is racing toward completion now, but it wasn’t always that way. In 2014, Planet Partners bought the first of three plots of land used to assemble the site on 44th Drive. It then made additional purchases in 2015 and 2016, Miguel Oks, a partner with the development firm, said. The project remained stagnant for more than a year, Oks said, as he and his partners sought a financial partner to move forward. When CBSK Ironstate — a collaborative entity created by SK Development, CB Developers and Ironstate Development — entered the picture things began moving quickly. CM & Associates broke ground on the project late last year and topped out more than a month ago. An on-site sales office is expected to open next month and the building is on track to be completed by summer 2019. 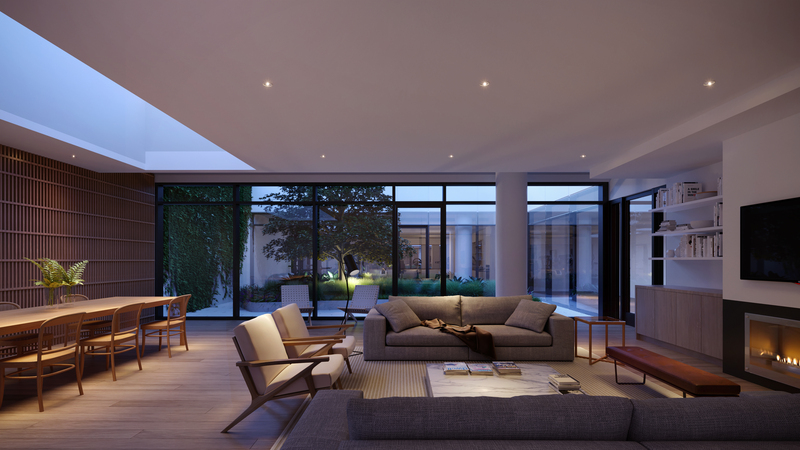 Residents will have access to an indoor lounge, a fitness center and an open air garden between the two. “Once Ironstate was brought in, everything really started to come together,” Oks said. Ranging from 400 s/f studios to 1,400 s/f three-bedrooms, the units will be outfitted with wood floors, marble counter tops and Miele appliances. Prices will start in the mid-$500,000 range to upwards of $3 million. Ricardo Esteras, project manager at CM & Associates, said special measures have been taken to keep the space tranquil for residents, including importing a double-layer glass curtain wall from Italy and increasing the concrete floor slabs to nine inches rather than the typical six. A layer of cork also will be installed beneath the wooden floorboards for additional sound-deadening. Although the sales push will not begin in earnest until later this year, sales director Jennifer Dorfmann, of Modern Spaces, said a few condos have already been sold and she’s had interest from buyers looking to combine multiple units.